My interests are in atmospheric and marine chemistry with particular emphasis on global biogeochemical cycles of trace metals, and the environmental impact resulting from metal emissions associated with human endeavors. My current and long-term research activities are focused on mercury in the environment, where the three- phase nature of mercury’s biogeochemical interactions and cycling offers a substantial investigative challenge. Anthropogenically related mercury emissions and discharges are a major concern, especially as to their influence on the bioaccumulation of monomethylmercury in biota (e.g., fish for human consumption) in open ocean and terrestrial systems. The Mercury (Hg) Laboratory was developed 30 years ago and has been recognized nationally and internationally for pioneering efforts concerned with the complex and ultra-trace cycling of Hg in the environment. We have developed much of the state-of-the-art ultra-trace collection and analytical procedures that are currently in world-wide use for studies of Hg in the environment. In May of 1998, I received the University of Connecticut Chancellor’s Research Excellence Award. Currently, I am investigating the atmospheric and aquatic cycles of mercury and other trace metals in a variety of multifaceted studies, which are often interdisciplinary and involve international collaboration. These efforts range from global models to studies of the role of microorganisms in elemental Hg and monomethyl Hg production. 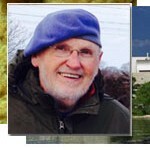 My research pursuits include a U.S./French cooperative program focused on Hg cycling in the marine environment, and with the development of innovative analytical techniques for the determination of Hg species and stable isotopes of Hg. The aquatic biogeochemistry of mercury in Long Island Sound is of special interest. Ombrotrophic peat bogs and lake sediments in Nova Scotia, New Zealand, and Arctic Alaska are being tested to determine the potential usefulness of such ecosystems in providing unequivocal records of contemporary and historical atmospheric depositional fluxes of mercury, as well as a measure of anthropogenic perturbations on a global basis, and as means of constraining regional and global models of the Hg cycle. I initiated a NSF supported program to examine Hg contamination and cycling in the Arctic. Alaskan lacustrine systems are emphasized. This work complements ongoing investigations into the pathways and processes determining the fate of mercury in coastal and open ocean environments. Boutron, C.F., G.M. Vandal, W.F. Fitzgerald and C.P. Ferrari. 1998. A forty year record of mercury in central Greenland snow. Geophys. Research Letters 25: 3315-3318. Lamborg, C.H., K.R. Rolfhus, W.F. Fitzgerald and G. Kim. 1999. The atmospheric cycling and air-sea exchange of Hg species in the south and equatorial Atlantic Ocean. Deep-Sea Research II 46/5: 957-977. Lamborg, C.H., W.F. Fitzgerald, W.C. Graustein and K.K. Turekian. 2000. Modeling the atmospheric chemistry of mercury using 210Pb and 7Be. J. Atmos. Chem. 36/3: 325-338. Fitzgerald, W.F., G.M. Vandal, K.R. Rolfhus, C.H. Lamborg and C.S. Langer. 2000. Mercury emissions and cycling in the coastal zone. J. Environ. Sci 12: 92-101. K.R. Rolfhus and W.F. Fitzgerald. 2001. The evasion and spatial/temporal distribution of mercury species in Long Island Sound, CT-NY. Geochim. Cosmochim. Acta 65: 407-418. Langer, C.S., W.F. Fitzgerald, G.M. Vandal and P. Visscher. 2001. Biogeochemical cycling of methylmercury at Barn Island Salt Marsh, Stonington, CT, USA. J. Wetlands Ecol. and Manage. In press. Lamborg, C.H., W.F. Fitzgerald, A.W.H. Damman, J.M. Benoit, P.H. Balcom and D.R. Engstrom. 2001. Modern and historical patterns of atmospheric mercury deposition as recorded in ombrotrophic bogs and lake sediments from Nova Scotia and New Zealand. Geochim. Cosmochim. Acta. Submitted.